Jokulsargljufur National Park is a huge natural area in the remote northeast of Iceland. 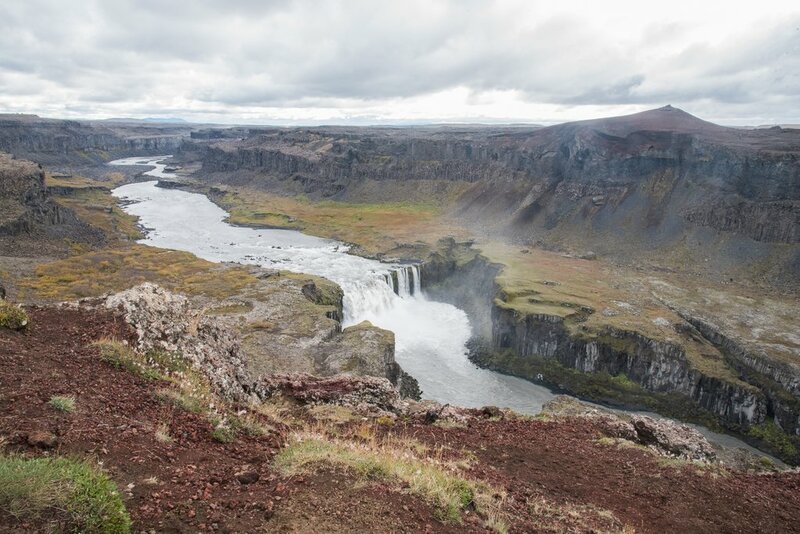 It's notable among hikers and waterfall enthusiasts due to its prominent landmarks: a triumvirate of waterfalls on the south end of the park, Hljóðaklettar and Rauðhólar in the center, and Asbyrgi Canyon to the north. There are plentiful hikes in the region, so you could easily a full day here; if you have the time, it's best explored over at least 2 or 3 days. Dettifoss is the most powerful waterfall in Europe, gushing around 6,816 cubic feet per second! The waterfall plays a role in the film Prometheus, as the waters where the alien falls. Its gray-white waters come from the wide river Jökulsá á Fjöllum, itself a runoff from nearby Vatnajökull glacier. 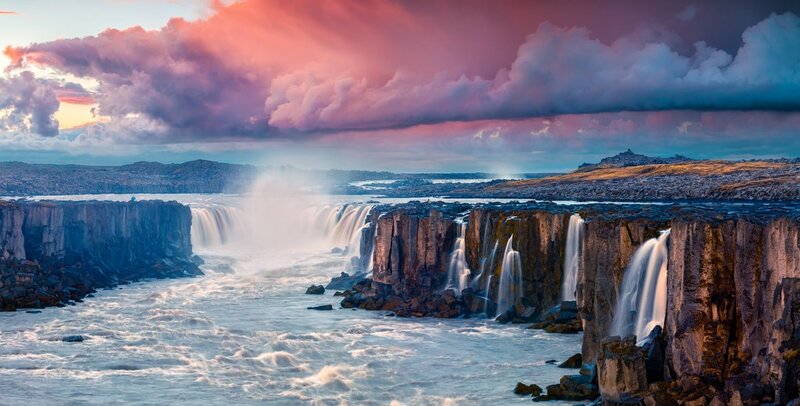 The falls are around 330 ft (100 meters) wide and drop 144 ft (44 meters) down into the Jökulsárgljúfur Canyon. It should take the average hiker less than 10 minutes to walk from the parking lot to the edge of the falls, but in wintertime, the walk requires some sturdy boots. Be careful near the edge, as the cliffsides can be slippery with mist or ice. 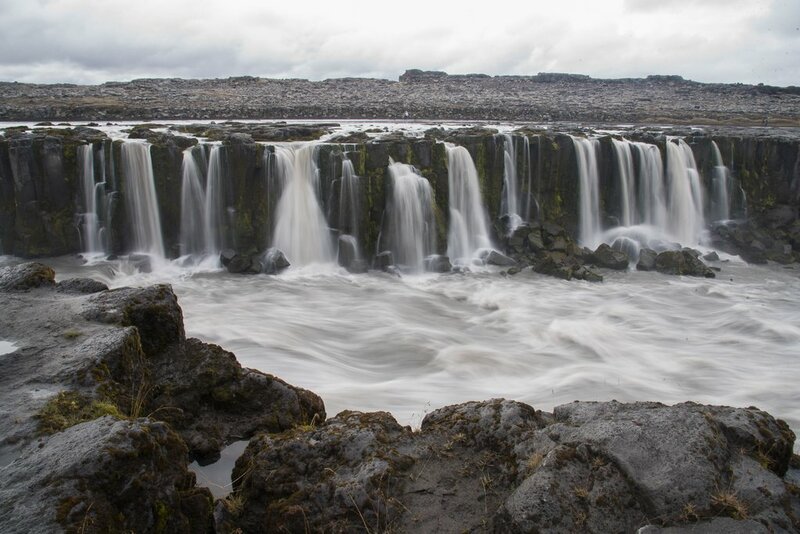 Less than a mile upstream from Dettifoss is Selfoss, the beautiful waterfall that also flows from the river Jökulsá á Fjöllum. Meltwater from the Vatnajökull travels all this way north and drops 36 feet (11 meters) at Selfoss, eventually making its way to Dettifoss. 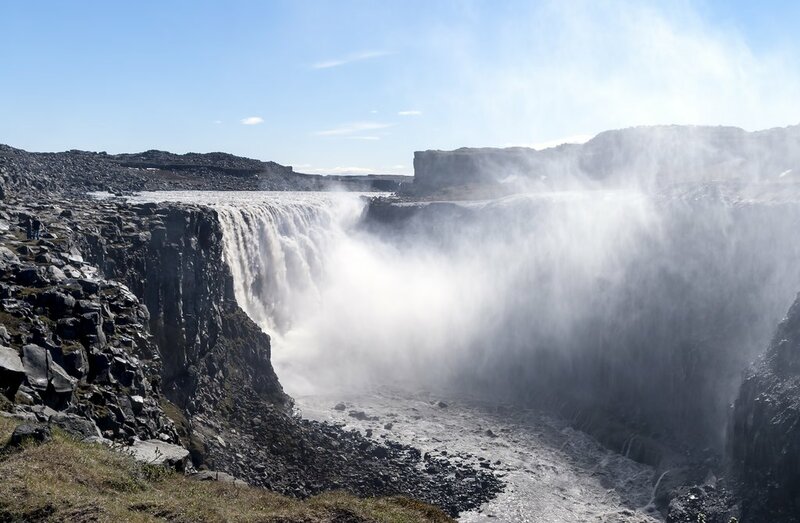 Downstream from Dettifoss is Hafragilsfoss, which drops about 89 feet (27 meters) in a thunder of roaring water. 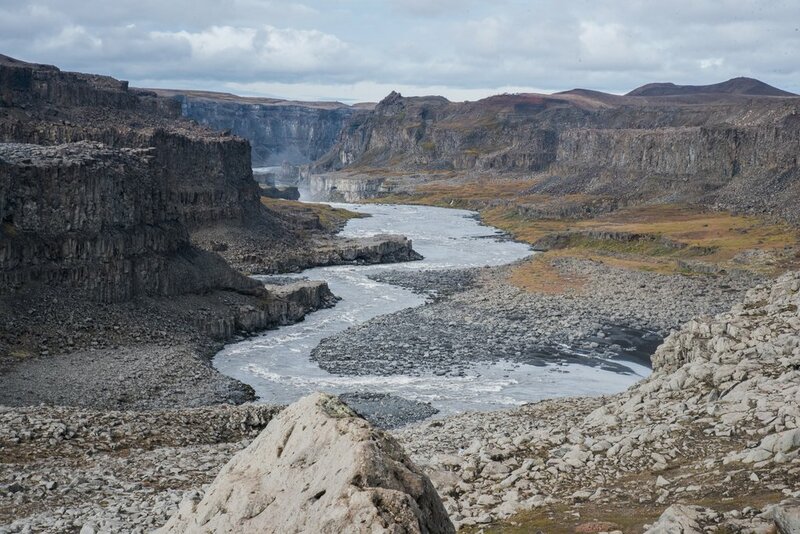 The muddy-white glacier water pours out into Jökulsárgljúfur Canyon and is accessible on both sides. To get there, drive out on the Ring Road (Route 1), go over the bridge and turn almost immediately onto Road Nr. 864. It’s a gravel road, difficult to maneuver, but after about 20 miles (32 km) it will take you to the parking lot and onto Hafragilsfoss. The Ásbyrgi Canyon is a huge landmark near Route 85, curving into a U-shape about 3.5 km (2 miles) from north to south. At the base of the canyon is a forested valley, with a rock island in the middle. Stop by the Visitor Center to pick up maps and learn more about the area. 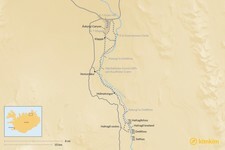 Geologists have determined that the canyon was carved out by flooding around 10,000 years ago, and again 3,000 years ago. 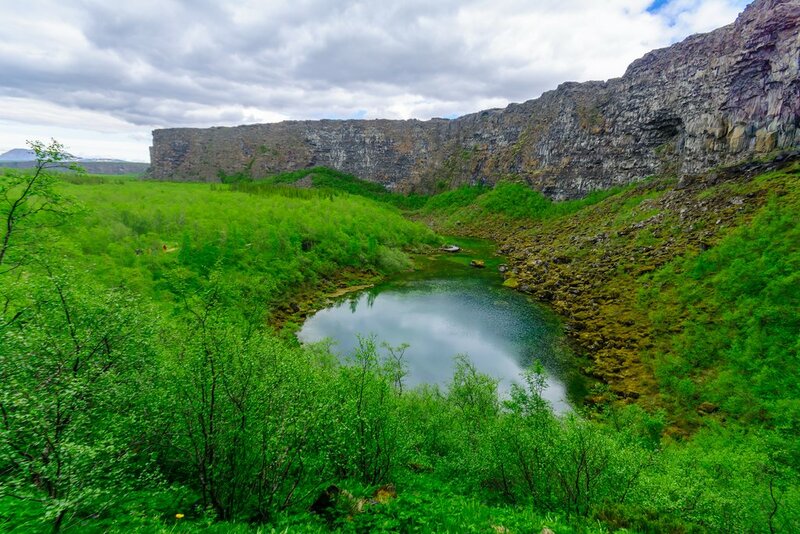 Local lore provides a different explanation: Ásbyrgi is said to have been stamped into existence by the chief god Odin’s eight-legged horse, creating the valley’s signature horseshoe curve. There are two roads, one on either side of the canyon, which don't connect. The eastward route is unpaved, but the views over the canyon are spectacular. You'll get a bit closer to Dettifoss, but views are from the side of the falls. The westward route is paved from the Ring Road and a bit more manageable, though the pavement ends north of Dettifoss. Keep in mind that many of the park's hiking trails start on this side. Ambitious hikers will surely be rewarded if they invest in a few days hiking the trail from Ásbyrgi to Dettifoss or vice-versa. Hiking about the luxuriant Jökulsárgljúfur Canyon, you'll encounter impressive gorges, clear springs, lush forests and quiet plains. The distance is about 20 miles (32 km) and you can start from either direction. From Asbyrgi to Vesturdalur, you have two routes to choose from: one along the rim of Asbyrgi and south along Klappir (12 km), and the other closer to the river (13.6 km). From Vesturdalur, continue about 8 km to Hólmatungur, where you'll need to cross the small, cold river of Stallá. From Hólmatungur, continue onto Dettifoss. 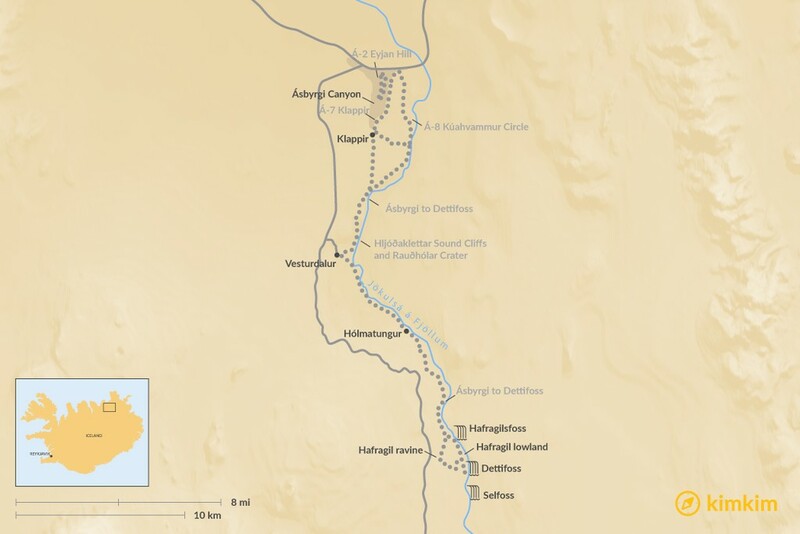 Here you can opt for the Hafragil lowland (10 km) or take the Hafragil ravine (11.5 km). The lowland is more difficult and isn't recommended for hikers carrying heavy burdens. The trail passes dangers of falling rocks and steep trails where you need to grab a rope for support. If you don't have sure footing, are scared of heights, or carrying heavy packs, choose the ravine route. Camping is only allowed at official campsites in Ásbyrgi, Vesturdalur and at Dettifoss. There are no cabins or mountain huts along this route. 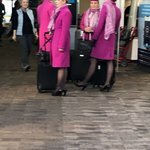 Be sure to arrange transport to and from the area with a tour guide--Kimkim can recommend a few of our reputable guides. Summer in Jokulsargljufur National Park is absolutely stunning, which is lucky considering its the only season that this area is open to the public. Roads close each year for the entire winter season, with closure dates depending on annual conditions. 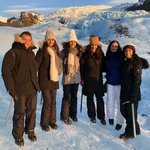 There are winter tour options, however, for private guided expeditions. To get there, take the tarmac Route 862 or the gravel Route 864. During bad conditions in winter, the roads can be closed and the hiking routes inaccessible. Be sure to check weather and trail conditions before you go. You can stay at nearby Húsavík, 45 minutes westward. Husavik Cape Hotel is a 16-room hotel with a beautiful view of Skjálfandi Bay. For a bit more of a rugged stay, try the Kaldbakskot Cottages, 18 newly built log cabins measuring 20-30 square meters.